Percusize Me! 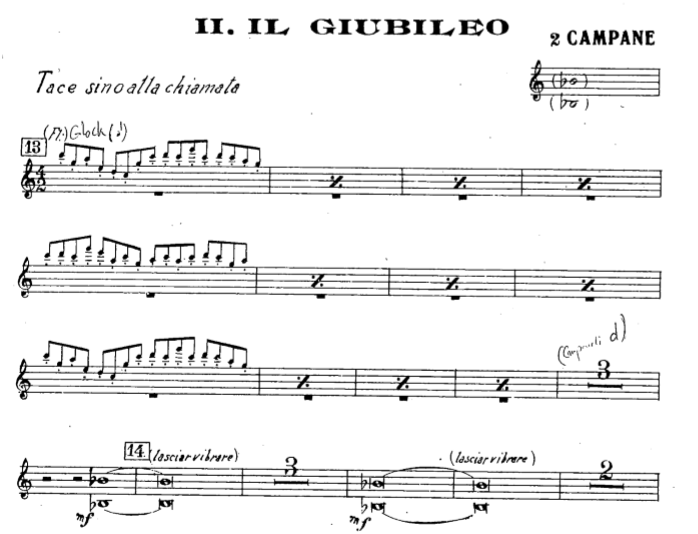 : "Tavolette" in "Roman Festivals", by O. Respighi. 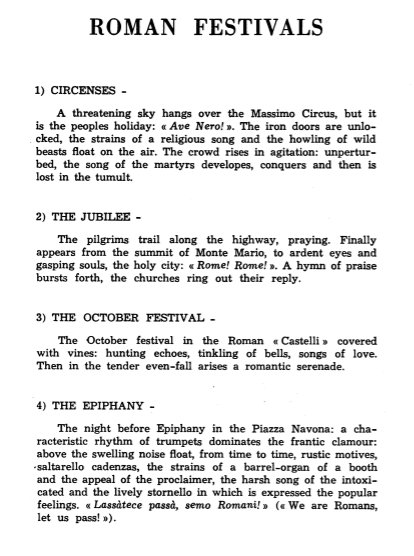 "Tavolette" in "Roman Festivals", by O. Respighi. At the end of the last season I was lucky enough to play "Feste Romane" ("Roman Festivals") which, together with "Fountains" and "Pines", form Ottorino Respighi´s "Roman Triptych". It´s a work featuring an exuberant, imaginative and brilliant orchestration. 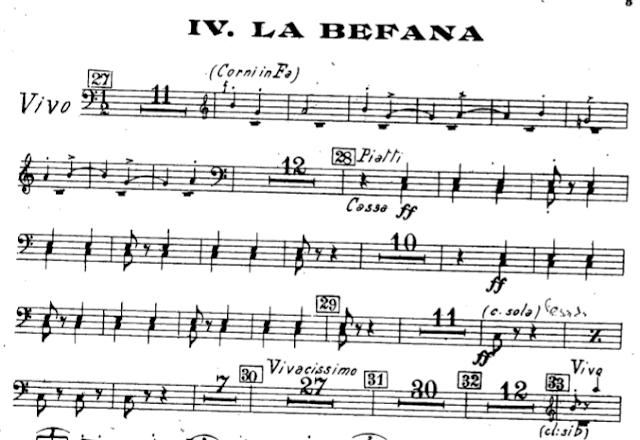 It requires a "percusive force" of one timpanist plus nine percussionists and, in its last movement ("La Befana"), the composer asks for "tavolette". This is an instrument quite unknown to percussionists and on which no consensus seems to exist. This article will try to clarify the different aspects concerning this part. The fourth movement is entitled "La Befana" (not a very precise translation above, I´m afraid), a witch whose "job" is equivalent to that of the Three Wise Men in the Spanish and Latin American tradition: to bring presents to good boys (and to bring coal to naughty ones) during the night between January 5th and 6th. 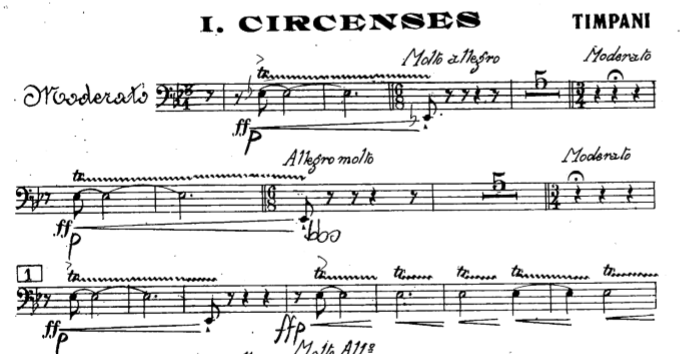 So, according to the description above, in this last movement we are dealing with a "maremagnum" of popular music, where several tunes overlap each other during the chaos of the festival. What is, then, a "tavoletta"? Literally, it´s a board, a plank... No coincidence "tavola", in Italian, means "table". In Spanish, "tabla" means "board". 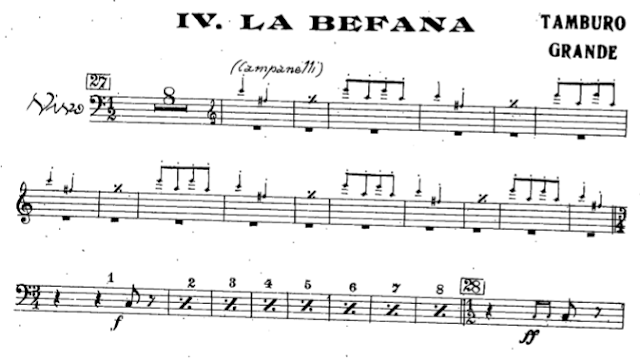 "Tavola" and "tabla" share the same Latin root. "Tavoletta" introduces the sufix "-etta", (a diminutive) which means "small" refering to whatever lexema you add it to. So, "tavoletta" means "small board". Same in Spanish: that sufix exists in the form of "-ita" or "-illa" (almost identical to the Italian one), meaning exactly the same: "small" to whatever lexema you add it to. 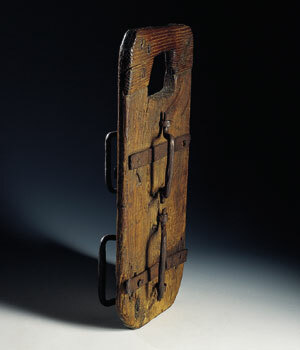 "Tavolette" is the plural ("small boards"). That's were Italian and Spanish differ, as we make plurals adding "-s" or "-es", and Italians make plurals adding an "-i" if masculine (reminiscence of the Latin second declination, "dominus/domini") or an "-e" if femenine (reminiscence of the Latin first declination, "rosa/rosae"). So, "tavolette" means "small boards". 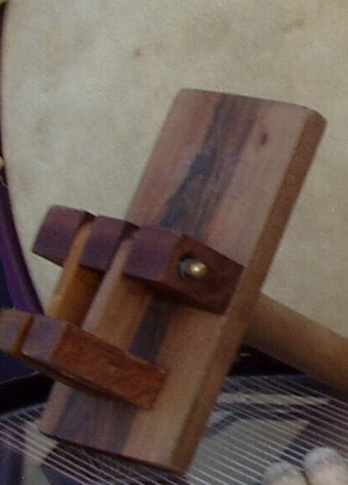 What percussion instrument is made with small wooden planks? In the Mediterranean area (both in Italy and Spain) there´s an instrument consisting in exactly that: a wooden plank hit by wooden hammers. Its name is "matraca", and it´s a popular instrument associated with several religious celebrations (Easter in Spain). "Matraca" comes from the arab "mitraqa" (meaning "hammer") and "taraq" (meaning "to hit"). The Spanish language uses that word and etimology, but not the Italian, as their peninsula was not occupied in the Middle Ages as it was ours. It´s, obviously, a popular instrument, nothing complicated. 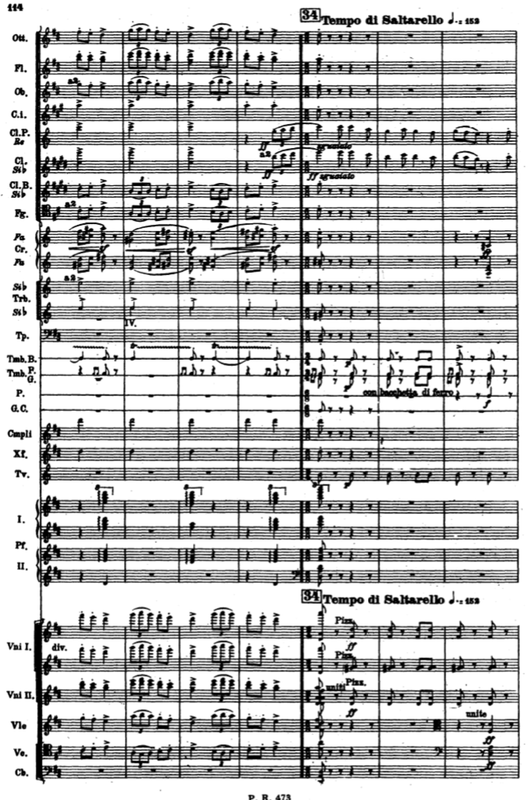 I can see a relationship with the orthodox tradition of the semantron which, under different forms (more or less evolved depending on the composer and time of composition) appears in this work by Respighi, "Les Choephores" by Milhaud, "Three Pieces for Orchestra" by Berg and, why not, Mahler #6. They are very simple devices, and their only purpose is to make as much noise as possible (exactly what Respighi tries to musically describe in "La Befana"). There are also instruments featuring a rotating handle (similar to that of a spinning wheel) which, when actionated, produce atrocious noise. In Spain exit a few of them (of gigantic proportions) instaled in bell towers. In the case of the "tavolette" asked for in "Feste Romane", its size is small, portable, allowing for it being carried in the streets to make noise during the festival. What can we use in the orchestra? Two wooden planks hit by two wooden hammers. 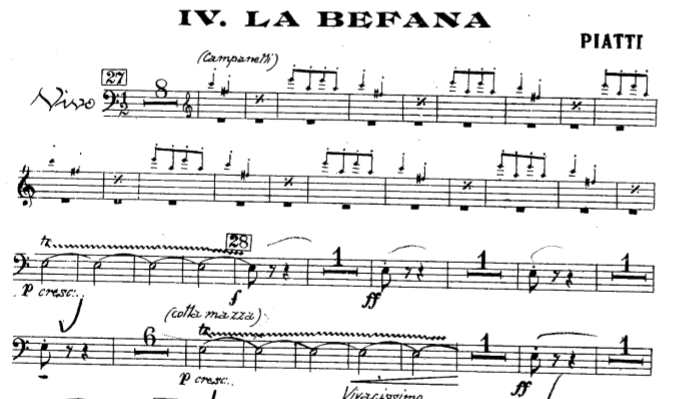 That´d be the solution I consider to be the closest to what Respighi intended. 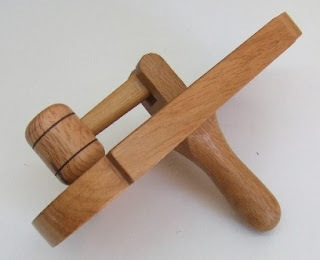 Having said that, we can use woodblocks, templeblocks, coconut shells... As long as we can produce two different "wooden sounds" (high and low), we´ll be ok. Don´t go for anything too fancy. Yikes... A treble clef! 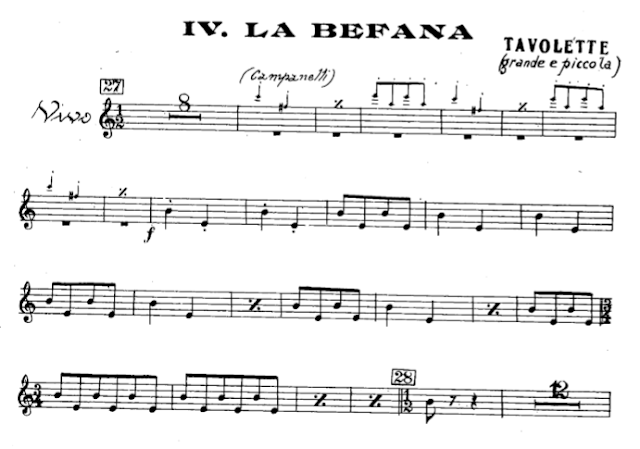 B and E. It seems like yes, "tavolette" have to play specific pitches. Sure...? Let´s have a look at the other parts. Yes... Treble clef, pitches (many!)... We all know the glock is a definite pitch percussion instrument. Again, treble clef, key signature, pitches... Because it´s a definite pitch instrument. Treble clef and two pitches. This part has an important clue: there´s an indication under "2 campane" stating what pitches to play (Bb in octave). We´ll be back to this later on. Hmmmm... Bass clef. C for the bass drum, E for the cymbals. Have you ever worried, when playing this piece, to get those exact pitches? No, because everybody knows these are indefinite pitch instruments. Bass clef. An E... Would you look for an E pitched cymbal to play this part? No, because they are indefinite pitch instruments. Treble clef, C... So you are going to tell me that you´d use a C pitched rachet, right? No, because they make noise, nothing more. Treble clef, C... No, this is not Mozart´s "Sleigh Ride" or "Three German Dances"... Nobody would ever worry about getting that exact pitch. Because of the bass clef, our tambourine should produce an E. Not likely, right? This was the part I played. Obviously, tunning to a C was not one of my worries. 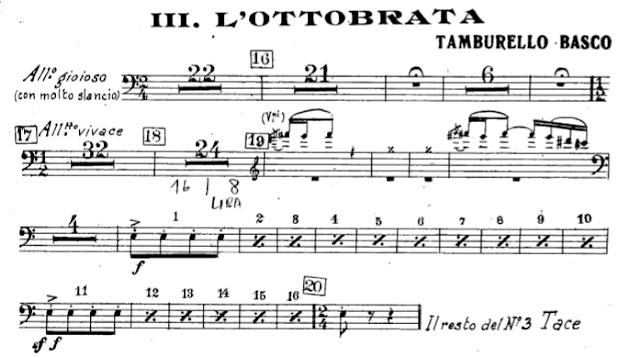 Yes, you guessed it: nobody would care about the C, as the tamtam is an indifinite pitch instrument. You already should have an idea of what´s going on... The copyst uses a pentagram and a clef whether the instruments are pitched or not. In this last case, he uses a treble clef for those producing high frecuencies and a bass clef for those producing low ones. He almost always uses the third space (except for the triangle, suggesting it´s the highest one). When two instruments share a pentagram (or produce low frecuencies), he uses the second (low instruments) and third space (high instruments). When writing the "tavolette" part (and this is what can lead to mistakes), he uses the first and third line. Still doubts? Let´s go back... In the bells/chimes part, right below "2 CAMPANE", there´s an indication stating what pitches to play. That´s to say, the "intonation" of the bells is specified, as they could be church bells of non specific pitches just making noise. He uses a treble clef, but the part is very specific about the pitches. Why? Because he would have written a treble clef even if no specific pitches were to be used (as he has done with all the indefinite pitch intruments in the work). 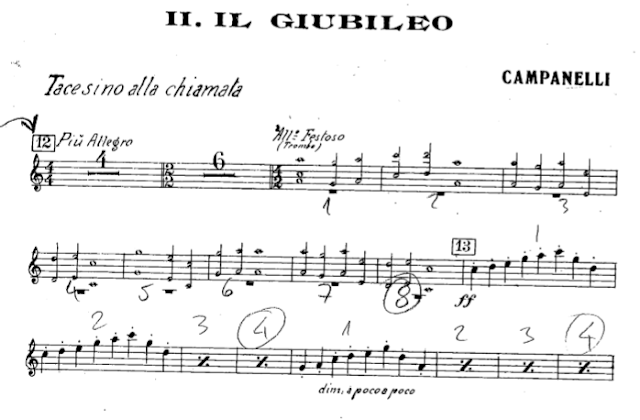 In the "tavolette" part, under the instrument name, "grande e piccola" ("large" and "small") is indicated. Nothing more. That´s the indication with regard to the "intonation" of the "tavolette". 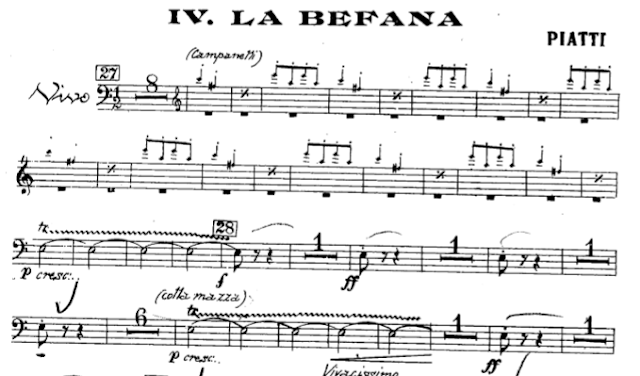 Should Respighi have wanted specific pitches, the copyst would have done as he did with the "campane" part, stating them below the name of the instrument. What the copyst has done here is indicating "large" and "small" as the only guide to the relative height of the instruments. Yes, he uses a treble clef (as he has done with other indefinite pitch instruments), but the indication is clear: no pitches, just "large" and "small". 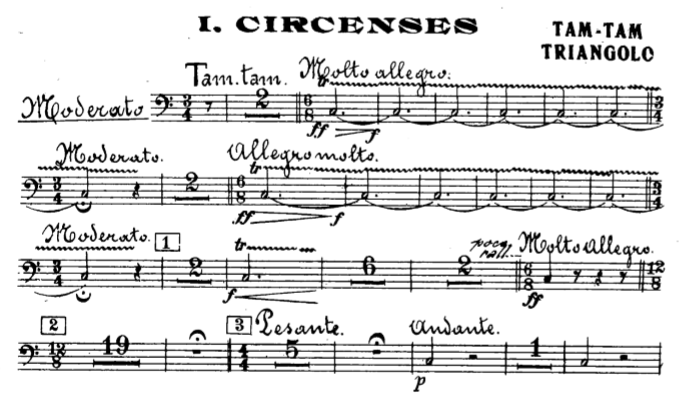 Should Respighi have wanted pitched wooden sounds, he could have used the xylophone, an instrument already in the score. Not the case. 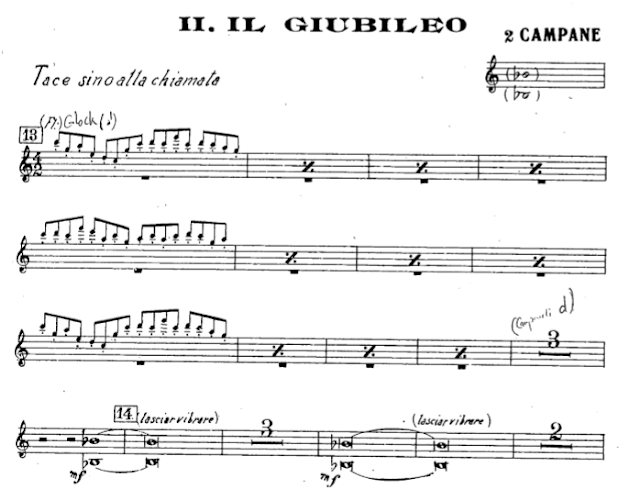 "Tavolette": just "grande" and "piccola" (large and small). Pitches are irrelevant. Still not convinced? Let´s take a passage at random and analyze it harmonically. So... IF EVERY SINGLE NON PITCHED INSTRUMENT is written using a clef, why is it that we have only have worried about assigning pitches to the "tavolette"? It makes no sense at all: we should assign pitches to all of them or to none. What´s the solution? The obvious one: indefinite pitch instruments make noises, they don´t play pitches. "Tavolette" are one of them, and if we haven´t worried about assigning pitches to the other instruments in the score, worrying about assinging them to the "tavolette" is absurd... "Tavolette": noise making popular instruments. Don´t over think it, as it´s quite clear that, knowing the instrument and the edition, they are non pitched instruments. Even more... If finding "tavolette" is quite hard, how hard do you think is finding tuned ones? Hard, very hard. So hard that they don´t even exist, as they are non pitched instruments. Tuned "tavolette" are as rare as a green unicorn. Don´t search for them, as you won´t find them (both "tavolette" and unicorns 😉). 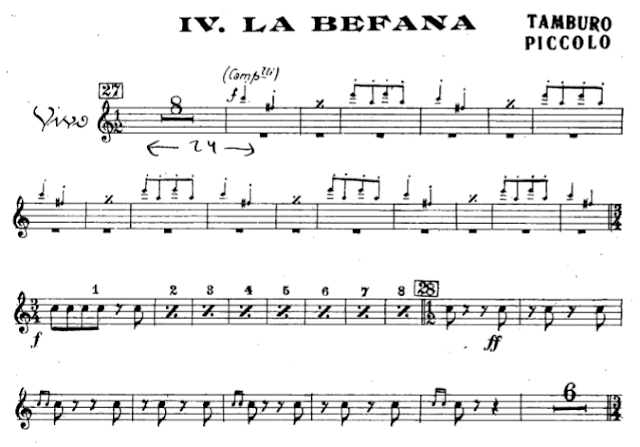 So, next time you play this piece, use the same common sense with the "tavolette" part you use when approaching the bassdrum/cymbals part, the triangle one or whatever non pitched instrument part featuring clefs and pitches: realize it´s an edition issue. Having said that, playing this piece is a wonderful oportunity to experiment trying to get a beautiful, musical and popular "tavolette" sound (and, obviously, enjoy a fantastic piece of the repertoire). 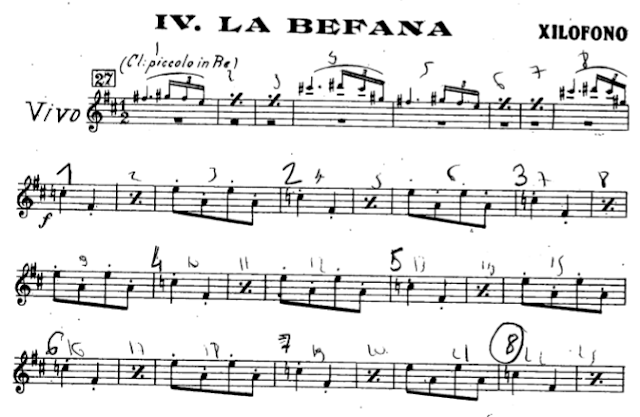 Should you get to play this piece, I´d love to know what solution you come up with. Let me know.